After months of congressional plans for continued flat funding, the Internal Revenue Service this month found itself on the receiving end of a $320 million cash infusion via the just-enacted $1.3 trillion fiscal 2018 omnibus spending bill. The agency—which has seen its budget reduced yearly since 2010—is immersed in the 2018 tax filing season while simultaneously implementing a landmark new tax law that critics characterize as rushed and sloppily drafted. To implement the Tax Cuts and Jobs Act, the agency has set up a Tax Reform Implementation Office to coordinate retraining and public education run by “members from across the agency who represent our best and brightest leadership,” Kautter said. In early January, the IRS updated payroll withholding tables for 2018 to reflect new brackets and exemptions, and in February it issued a revised Form W-4. Also in the works are new guidance publications. “We estimate we will need to create or revise about 450 such products,” most for the 2019 tax season, Kautter added. “This is a tall order. It’s more than double the number of forms we would create or revise in a typical year.” Each form or blank return costs about $75,000 to redo, he said. The new law gives IRS 79 explicit grants of regulatory authority, the acting chief reported, though more than 70 percent of the funding will go to reprogramming and modernizing information technology systems. The White House, in its fiscal 2019 budget proposal, wanted to raise caps on the enforcement budget for its program integrity efforts, which the Treasury Department said would generate $4 for every $1 invested. But that plan didn’t make it into the omnibus bill. 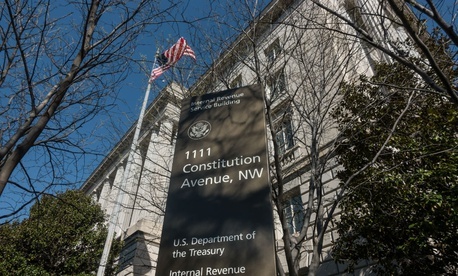 The agency’s training classes, an attorney in the IRS’s Exempt Organizations division told Government Executive, are being scheduled but are not rushed because not all the coming changes take effect this year. Paul Streckfus, editor of the EO Tax Journal, told Government Executive “the legislative language is a mess, but for the high-level folks at Treasury and IRS, the new tax law is a challenge and a resume-enhancer if and when they seek private employment.” Though he had not heard complaints from IRS employees, many nonprofits—particularly hospitals and colleges and universities—are upset about major policy changes, he said. “Overall, the result of the tax act provisions affecting exempt organizations is confusion and gross unfairness." Key lawmakers such as House Ways and Means Committee Chairman Kevin Brady, R-Texas, and Sen. Finance Committee Chairman Orrin Hatch, R-Utah, are already making plans for additional legislation to make “technical corrections” to the new law. Industry and accounting groups are applying pressure. On Monday, Reps. Lynn Jenkins, R-Kan., and Rep. John Lewis, D-Ga., both on Ways and Means, introduced a bill to “redesign” the IRS for the first time since 1998. It addresses modernization, taxpayer rights and IRS obligations to keep taxpayers notified of movements in their cases—all issues raised over the past year in multiple hearings.